Happy Labor Day friends! I hope you all had great weekend. My poor Jeremy got wrangled into working overtime so the boys and I had lots of mommy-son time. Which equals lots of play time at the park and lots of requests for snacks, juice boxes and treats. Remember the first Friday Pie Day post when I said I was hoping that by having pizza once a week my boys would get into the routine of having pizza once a week they wouldn’t ask for it all the time. Well quite the opposite has happened; they ask for “mommy pizza” ALL THE TIME! 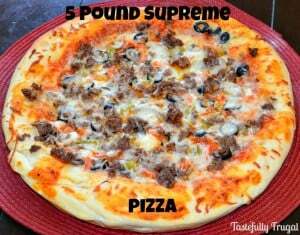 The requests seemed to increase tremendously after we had this supreme pizza last week. I know I said this about our last pizza too, but this is my favorite pizza EVER. This pizza was loaded with toppings and the all the flavors blended perfectly. I didn’t realize how much I had put on it until I picked it up to put it in the oven…and seriously it had to weigh at least 5 pounds! It was so big that we had to cut the slices extra small for the boys to eat because there was no way they could have eaten a regular size slice with out making a huge mess! If you have pizza lovers in the family this is the pizza to make for them! And as always you can make this ahead of time, freeze it and thaw it on the counter as your oven preheats. Spread pizza dough out along pizza pan. Add remaining tops and top with remaining cheese. Bake for 15-20 minutes or until dough is light brown. I cooked for 18 minutes and it was perfect. 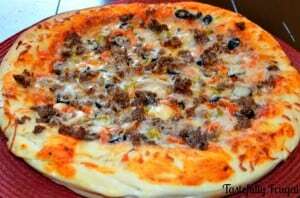 **I have started making my pizza dough Thursday afternoon while my boys nap and letting it rise over night. The dough is much easier to work with and tastes better too! We love pizza! When we are on Long Island we can get the BEST pizza but when we go to Florida I always make a pie for us. I’ve heard New York has the BEST pizza… If we ever get the opportunity to visit eating a NY pie is definitely on my list of things to do! Hopped over from Tasty Tuesdays to see this awesome pizza! It’s only 9:30 in the morning but, boy, I would like a big slice of that pie right now! Thanks so much Adrian… It does make a great breakfast, or brunch. I’m not ashamed to admit we had leftovers for breakfast the next morning! Thanks for stopping by! Thanks so much Joy! 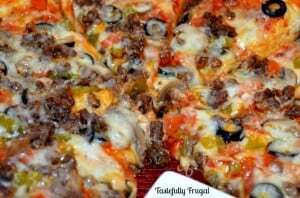 Yes hearty pizzas always go over well in our house too! I’ll have to go check out some of your pizza recipes and your chocolate chocolate cheesecake sounds amazing! Headed over now to check it out! That is quite the pizza! I love making my own pizzas at home, especially grilled pizzas! It’s been awhile since I did that, maybe I should have a Friday pizza night, too! Thanks for sharing with Hump Day Happenings. Homemade pizza is the BEST! Yours looks super yummy! Now I want to make one. Pinned it. Thanks for sharing at Home Matters. Please do come again and share your creativity with our readers! Whoa, that’s a lot of pizza! Thanks for linking up (and co-hosting). I’ve pinned this recipe to the Creative K Kids Tasty Tuesday Pinterest board.